NurseBall 004, originally uploaded by Sarah Craig. There's not a lot of photographing going on at the moment. I'm still working on my final wedding album of the summer season and trying to get organised to start the photo sessions for my MA project. This week however I have photo debts to pay! 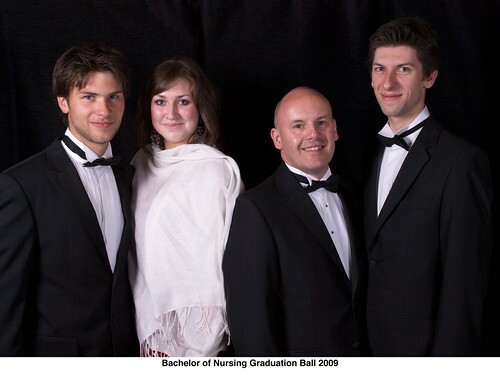 The above photo is from the Manchester University Nurse's Graduation Ball where my friend James (far right) arranged me to be photographer. It proved to be the most manic night and I ran out of mounts, then ink and paper and finished working at 2am! So I didn't print the images for James, allowing others to have their prints, and i'd give James his when he got back from Australia. So they're back now, and James will get the above photo amoungst others on Thursday.